(3431, W. P. Campbell Collection, OHS). (3368, H. M. Dorman Collection, OHS). The Iowa Tribe of Oklahoma is headquartered near Perkins in Payne County. 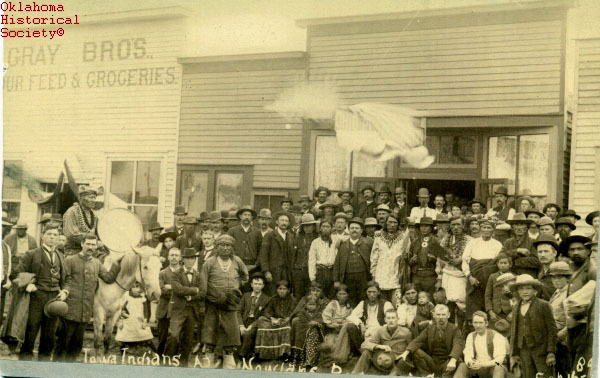 Beginning in 1878 bands of Iowa left their Kansas-Nebraska reservation and settled among the Sac and Fox in Indian Territory, where they were assigned land in 1883. Situated between the Cimarron and Deep Fork rivers, the Iowa reserve included portions of present Payne, Logan, Oklahoma, and Lincoln counties and was allotted to 109 tribal members in 1890. 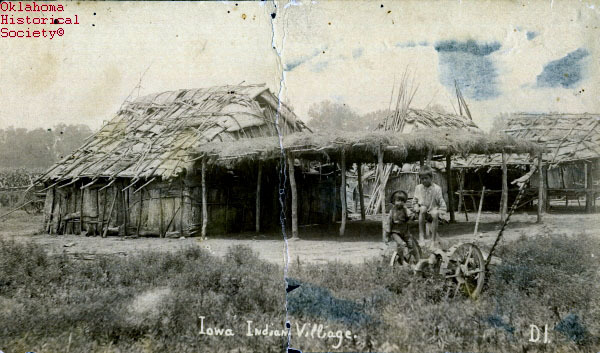 The Iowa called themselves Bah-Kho-Je, meaning "gray snow," and were a Siouan people who spoke the Chiwere language. Their first reported contact with Europeans occurred at a Winnebago village on Green Bay in 1676. During the eighteenth century they moved eastward across the present state of Iowa from the Missouri River to the lower Des Moines River. By the early 1800s their villages were situated along the watercourses of northern Missouri. The Iowa were organized into two clan divisions, with the head chiefs of the Buffalo and Bear clans each providing principal semiannual leadership. By 1839 the Iowa had ceded all their tribal land in Iowa and Missouri and resided on the Great Nemaha Reservation in northeastern Kansas and southeastern Nebraska. There factionalism developed between the mixed-blood and full-blood populations. While the mixed-bloods farmed and assimilated into the Euroamerican culture, the full bloods followed their traditional heritage and opposed allotment. To preserve their way of life the latter moved to Indian Territory starting in 1878. Consequently, two Iowa tribes exist—the Iowa of Kansas and Nebraska, and the Iowa of Oklahoma. The Iowa Tribe of Oklahoma was organized under the Oklahoma Indian Welfare Act of 1936 and adopted a constitution and bylaws in 1937. A five-person business committee governs them. There were 496 enrolled members in 2003. Tribal revenue is generated through the Cimarron Casino at Perkins, and BKJ (an acronym for Bah-Kho-Je) Solutions, a tribally owned company involved in trucking, energy marketing, construction management, and archaeological and environmental services. An annual Iowa powwow is held each June. Martha Royce Blaine, The Ioway Indians (Norman: University of Oklahoma Press, 1979). Berlin B. Chapman, "Dissolution of the Iowa Reservation," The Chronicles of Oklahoma 14 (December 1936). Berlin B. Chapman, "Establishment of the Iowa Reservation," The Chronicles of Oklahoma 21 (December 1943). Mildred Mott Wedel, "Iowa," in Handbook of North American Indians, Vol. 13, Book 1, Plains, ed. Raymond J. DeMallie (Washington, D.C.: Smithsonian Institution, 2001). Jon D. May, "Iowa," The Encyclopedia of Oklahoma History and Culture, https://www.okhistory.org/publications/enc/entry.php?entry=IO001.